Melatonin plays many roles in the human body, influencing a variety of physiological systems. Evidence implies that this hormone may play a role in anti-aging as well. From alleviating pain and increasing fertility to helping you lose weight, melatonin appears to be nature’s own wonder drug. Unlike many wonder drugs, this one is made deep inside your brain. Recent research indicates that melatonin may also be powerful as an antioxidant and an anti-aging drug as well. When most people hear the word melatonin, they think of sleep. Indeed, melatonin is an important part of your sleep-wake cycle, helping you to feel sleepy when it is dark. However, it plays a variety of other roles in the human body as well. Recent research indicates that melatonin affects a lot more than sleep. Fibromyalgia is linked to low melatonin levels, and taking a melatonin supplement can alleviate many of the symptoms. Melatonin levels may be the cause of other chronic pain disorders as well. Melatonin also has been linked to clinical depression and other mood disorders. 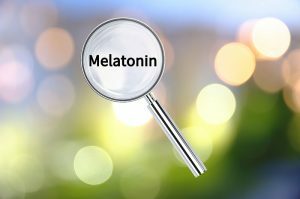 In fact scientists can predict with high sensitivity whether a person is depressed simply by testing serum levels of melatonin. Melatonin also has been linked to female fertility. Women who take melatonin during their IVF cycles are more likely to conceive. They also have healthier pregnancies with lower rates of preeclampsia and other complications. Research in chronobiology has found that melatonin can also aid in weight loss, increasing metabolism to a noticeable degree. Anti-Aging: Could Melatonin Be the Fountain of Youth? Melatonin may have a huge impact on aging, according to chronobiology research. This neurohormone may reduce damage to skin caused by UV radiation, which is one of the major causes of aging’s effect on the skin. While we tend to focus on superficial aspects of aging such as wrinkles and UV damage in our culture, internal aging is just as important. Melatonin appears to reduce age-related changes in our organs and bones as well, acting as an anti-aging agent throughout the body. Bone loss is a major issue in aging as well. Prevention of fractures and other damage due to age-related bone loss are a challenge for elderly people and the people who care for them. Melatonin may reduce age-related bone loss, allowing elderly people to lead lives with less fear of injury. The hormone’s antioxidant effects appear to be especially high in the brain, where oxidative damage can lead to senile dementia, memory loss and a variety of age-related cognitive decline. While the circadian rhythm and our sleep-wake cycles are an important part of health, melatonin has been found in chronobiology studies to affect our bodies in a multitude of ways. From treating depression to antioxidant and anti-aging effects, the effect of this hormone on the cell cycle can increase health in a variety of ways. Getting enough melatonin, whether from your pineal gland or from a supplement, can improve almost every aspect of your life. There was a time when chronobiology research was focused on improving how we sleep. However, we are discovering new applications almost every day. Getting enough sleep, and enough of the hormones that govern sleep, is one of the foundations of good whole body health.